At 22 years old and having graduated from college just last year, saving for retirement wasn’t a priority for me. I recently stumbled upon a page from Beth Kobliner’s upcoming fourth edition of “Get a Financial Life,” and one piece of advice she gave really made me realise the need to start saving for retirement. Right now. “If you don’t start saving in a tax-favoured retirement account while you’re young, you’ll miss out on perhaps the best investment opportunity of your life,” Kobliner writes in her book. 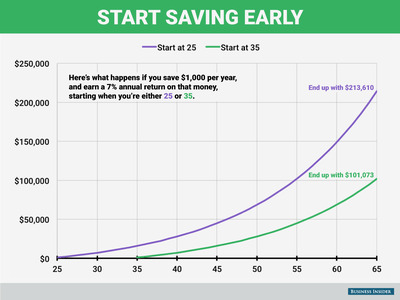 Kobliner describes two scenarios: setting aside money starting at age 25 and setting aside money starting at age 35. In both scenarios, the account’s returns are 7% (although investment returns are unpredictable, 5-7% is a typical range used in this type of calculation) and contributions are $1,000 per year. 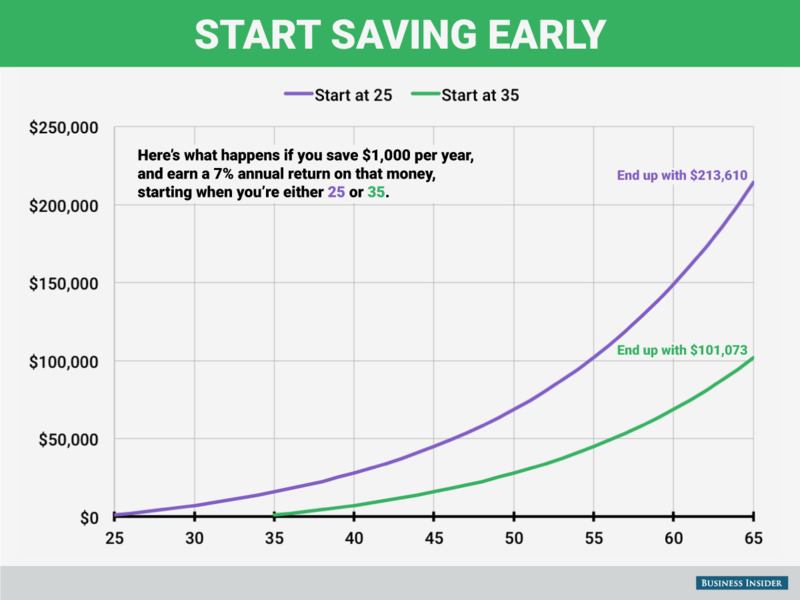 In the first scenario, you save $1,000 every year from age 25 to age 65 in a retirement account earning 7% a year — a total of $40,000. By the time you turn 65, you’ll have $213,610. In the second scenario, if you save $1,000 every from age 35 to 65 in a retirement account earning 7% a year — a total of $30,000 — by the time you turn 65, you’ll have $101,073. If you wait 10 years, you essentially lose half the amount. There’s also a limit to how much you can contribute every year to a retirement account. depending on which one you have. According to the IRS, the most you can contribute to a traditional or Roth IRA account per year is $5,500 (or $6,500 if you’re 50 or over.) The 2016 contribution limit for a 401(k) is $18,000 (those age 50 and over can contribute an extra $6,000). So starting later means contributing less money overall, and ultimately reaping a smaller reward. Retirement savings plans offer terrific tax advantages that allow your savings to grow rapidly. In order to maximise the benefit, though, you need to get started right away. The government limits the amount you can set aside each year, so if you don’t do it now, you won’t be able to make it all up when you’re older. Saving for retirement is crucial. However, it can be intimidating to dive into, as it was for me. It’s also not taught in school, it’s not a conversation my parents could have had with me easily — they are immigrants who aren’t very familiar with the US retirement savings vehicles — and I had student loan debt to worry about. But finally seeing those numbers really made me regret not getting started earlier. Though I still don’t have a complete understanding of retirement accounts, I am definitely more proactive in finding answers I need. I have also reached out to my peers to see what they are doing to save for retirement and many of them are just like me — unsure about retirement savings accounts but aware that it’s just as important as paying off student loan debt. I plan to start saving by the end of the year.